Visiting Queen Creek, Arizona? Live in the Villages at Queen Creek? Hungry or in desperate need of coffee? Look no further than The Bistro! Conveniently located just south of downtown Queen Creek at the southeast corner of Old Ellsworth Road and Sierra Park Boulevard, The Bistro is an eclectic cafe offering delicious fare of flatbread pizzas, paninis, tasty grilled sandwiches and more. If you’re looking to get your caffeine fix on, The Bistro also provides a full-service coffee bar. The Bistro's coffee bar mixes up your typical lattes, cappuccinos, cold brews and teas. Including specialty espresso drinks like "the bistro latte" (espresso, brown sugar, sweetened condensed milk and skim milk....oh my.) and "muldoon's latte" (espresso, vanilla, white chocolate, cinnamon, skim milk...ditto on the "oh my" statement from earlier). Now that we've covered The Bistro's caffeine fix offerings let's talk other drink offerings. You guessed it, this local QC cafe has what's called "the bistro bar" which serves up adult beverages of white and red wines, sangria and cocktails. Don't worry, I won't leave you hanging like that and not get into the mouth-watering ingredients of said drink list! Full disclosure, I haven't yet tasted any drinks from the bistro bar. A travesty, I know. So going strictly off The Bistro's menu, here are a few of their age-restricted drink items you'll find. 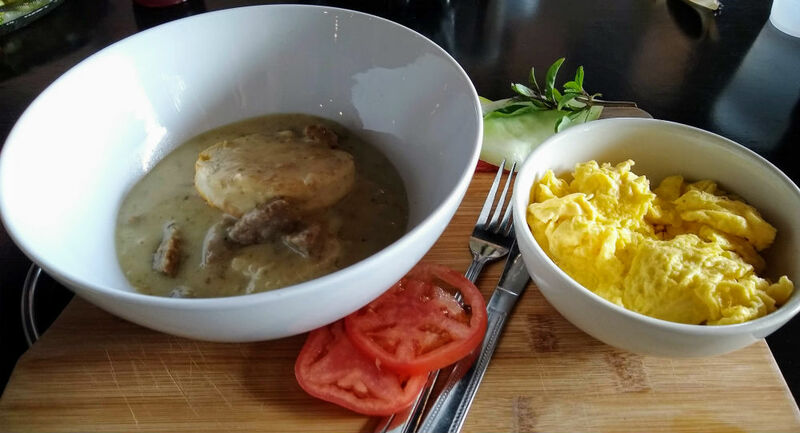 The Bistro Queen Creek | B & G half order with side of scrambled eggs. Kudos to you for waiting so patiently for the food. Mmm, the yummy food. If I had to describe The Bistro's food overall in five words or less it would be; made fresh, distinctive, intriguing, tasty, more, please. Okay, seven words. Instead of me rambling on and listing the menu items, I invite you to give The Bistro a try and discover the goodness for yourself. Maybe first check out their Instagram page @the_bistro_queencreek or facebook page @thebistroqc. The staff is consistently posting specials and tempting food pics. I'd be willing to bet your curiosity will be peaked to lead you down Old Ellsworth Road directly to this local eatery hot spot. You can bet, I will be branching out on my next trip to The Bistro and perhaps will be giving the white wine sangria a try, versus my usual delicious iced vanilla breve latte. That being said, I may have to consider visiting in the evening for dinner, versus the morning for breakfast for this particular culinary outing. Ha!